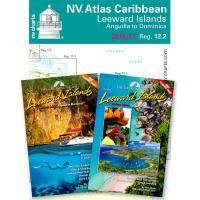 Buy NV Charts Leeward Islands, Chris Doyle's Cruising Guide to the Northern Leeward Islands and Cruising Guide to the Southern Leeward Islands together for $130.65 (retail $153.70)! 2016/2017 edition, now covers all the Leewards: Anguilla, St. Martin, St. Barths, Barbuda, Antigua, Saba, Statia, St. Kitts, Nevis, Redonda, Montserrat, Guadeloupe and the Saintes, and Dominica. Developed from recent surveys and GPS accurate, this latest release is an indispensable navigation tool and Cruising Guide companion for yachtsmen sailing the islands of the Caribbean. Full-color charts feature fine contours and easy-to-distinguish color gradations of the depth lines: turquoise for coral reefs, red for the 2-meter line and blue for the 5-meter area (all depths in meters). With well marked rivers, towns and street plans to help yachtsmen gain a clear overall view of shoreside facilities. Red numbered waypoints with coordinates based on WGS 84 enable accurate navigation with GPS. Includes heavy-duty reusable plastic envelope and magnifier. By Chris Doyle, this 15th edition (2018-2019) is split into two guides, The Cruising Guide to the Northern Leeward Islands and The Cruising Guide to the Southern Leeward Islands. The Cruising Guide to the Northern Leeward Islands picks up where The Cruising Guide to the Virgin Islands ends, covering the islands of Anguilla, St. Martin & Sint Maarten, St. Barts, Saba, Statia, St. Kitts, Nevis, Redonda, and Montserrat. 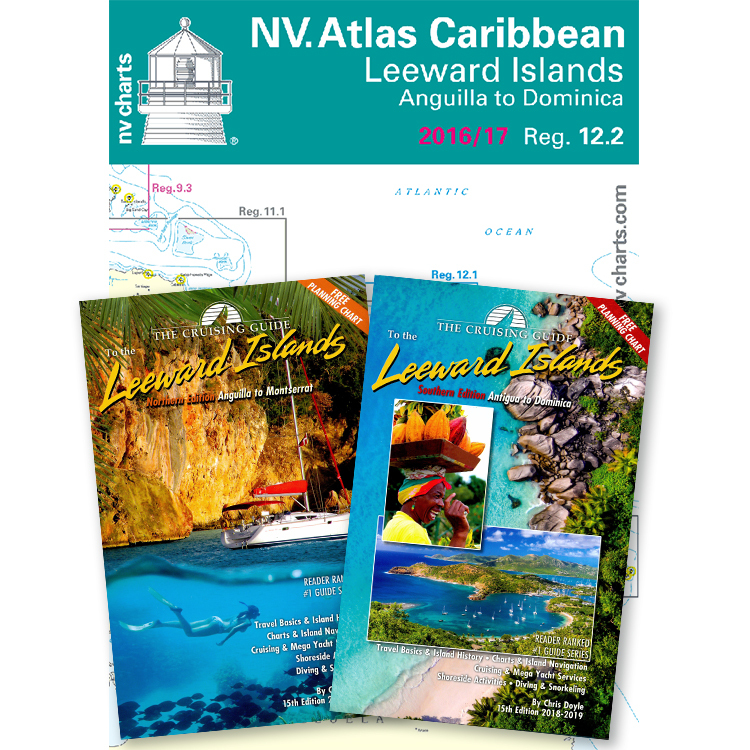 If you are sailing south, there is a section that covers passages to the islands covered in The Cruising Guide to the Southern Leeward Islands. By Chris Doyle, the Cruising Guide to the Southern Leeward Islands picks up where The Cruising Guide to the Northern Leeward Islands ends, and covers the islands of Antigua, Barbuda, Guadeloupe, Marie Galante, the Saintes, and Dominica. If you are sailing south, there is a section covering passages into the Windward Islands (Martinique, St. Lucia, St. Vincent and Grenada), which are covered in The Sailors Guide to the Windward Islands.